"Kiddles" were popular dolls from the mid-60s to the mid-70s, and inspired other lines of "little" dolls, including those wacky, color-confused "Upsy Downsys!" The Mattel Company was on a roll in the 60s and 70s, producing several brands of successful toy lines including Barbie and her friends and a variety of colorful inch-high dolls called "Kiddles." As often happens with successful ventures, the people behind the success look for ways to replicate their "win." 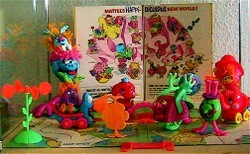 Kiddles proved to the powers that be at Mattel that there was a market for "little dolls" and they subsequently invented another, similar franchise in the hope that it would be equally successful. The Upsy Downsys were a delightful, and slightly bizarre, line of toys from 1969 depicting a bright, colorful, magical cartoon land and these toys achieved a small amount of success before fading away into the ether like some particularly vivid (or perhaps chemically induced) dream! 1) Who were "Upsy Downsys?" The Upsy Downsy people (and "Upsy Downsy Land") were introduced in a small, colorful storybook geared towards younger (7 and under) children. It told the story of how a windstorm blew a field of dandelions through the air and how some of the dandelions fell back to earth through a rainbow and turned into funny, colorful little people who landed on their feet, and were thusly called "Upsys." Some of them fell through a storm cloud, landed on their hands upside down and were branded "Downsys." Together they lived in a peaceful commune littered with magical, smiling mushrooms, anthropomorphic two-headed vehicles, self-propelled carnival rides, leering, dog-faced hot dog stands and a moebius strip of roads and bridges. Remember...it was the late 1960s! 2) OK...but WHAT were the Upsy Downsys? The Upsy Downsy dolls were between 2 and 3 inches tall and adorned with eye-poppingly bright colors, painted faces, plastic clothes and yarn hair. "Upsy" dolls were tiny, multi-colored creatures that looked like toddler girls with...neon afros. Bearing names such as Flossy Glossy, Baby So High (but of course!) and Tickle Pinkle (?) each Upsy came with a small, rolling vehicle, a road sign saying something helpful like "This way!" or other roadside accessory. Each came with a cardboard play mat with a road path printed on it and a story book explaining the history and relevance of the particular Upsy you happened to have purchased. Downsy dolls were very much the same in spirit only there were males in the species, they had much goofier-looking faces and...well...*hands*...sprouting out of their...umm...skulls! The Downsys were truly unique; you could either stand them on their feet or rest them upside down, on the hands that came out of their humpty-dumpty-esque head-bodies. They could sit in their cars upside down or walk down the street upside down or greet each other in public...upside down. The cardboard play mat each doll came with was designed so the beginnings and endings of roads lined up and if you had enough Upsys and Downsys you could connect them all and create a vast network of twisting, winding, go-nowhere roads for the Upsy Downsys to navigate in their smiling ladybug or multi-limbed car. The boxes these toys came packaged in contained a surprising amount of order as to how an Upsy or Downsy was marketed; with bright graphics and a clear-plastic display front to the relatively large box, Upsy Downsys were tremendously appealing to children who enjoyed fanciful, colorful toys or were addicted to H. R. Pufnstuf, and were relatively cheap at $1.99 a doll. Out of the box, however, and displayed on a play mat board with all their various un-related sub-species and accoutrements in tow, the collective looked somewhat more chaotic and random; in fact, most Upsy Downsy collections, with their dabs of hot pinks and purples and yellows, look a bit like the vomitous of circus clown who has supped too long at the cotton candy machine. 3) What happened to the Upsy Downsys? Like their fore-sisters the Kiddles, it seems a strange purge took place in Mattel's little doll world around the mid-1970s. By 1976 you would be hard-pressed to find any small dolls of quality whatsoever, let alone the highly ornate Mattel dolls which always had some small bead or ruffle ornamentation glued to them, to good effect. Speculation is that Mattel got into trouble when children tried to eat their candy colored dolls and choked on them; another possibility is that, as changing generations do, children simply moved on to other interests besides dolls painted the colors found on the side of the Partridge Family Bus. Certainly, Mattel continues to this day as a successful manufacturer of toys and aside from Baby Boomers and nostalgia-addicts such as myself it doesn't appear anyone particularly mourns the loss of the Upsy Downsys. I missed the boat on these toys when I was a kid--for some reason my Kiddle-addicted sister never possessed a single Upsy OR Downsy (she probably thought them too...strange...) and they were deemed a little too "girly" a toy for a boy, but a neighbor girl had the full line and I was obsessed with them. When I ran across some of them in a consignment shop in the late 90s a whole world of memory opened up to me, that ridiculous era of the early 70s when it seemed like mixing stripes and polka dots was a pretty good idea, and everyone seemed a lot easier-going, regardless of what chemical was inducing this laid-back attitude. I remember it, at least from a child's perspective, as a time of good will and open-mindedness, and the Upsy Downsys symbolized this: they existed simply to extol and create happiness! I have a sad feeling the dolls' extinction was eventually caused by the changing, "me"-obsessed, cynical attitudes of the late 70s and early 80s as much as anything else. I like to think that somewhere the Upsy Downsy are sitting on a hot-pink, yarn cloud (upside down, of course) waiting for us to be ready for them to visit again and spread their silly good cheer! In this third book in his "Anomalous" series, former Disney/DreamWorks studio animator showcases his popular sketches of voluptuous women. Haven't heard of them before but these vintage toys are adorable. I missed out on these, too, back in the day. Maybe I need to find a toy cupboard and raid it...on eBay! Mattel's "Kiddles" were popular dolls from the mid-60s to the mid-70s, and seemed to get smaller (and stranger!) as the years went on. Behold, "Jewelry" and "Zoolery" Kiddles! To make your own paper dolls or buy ready ones has always been a passion of mine. Now I am teaching my grand daughter to do the same.